The design developed from a line drawing which represents a man and a woman (myself and a girlfriend) as illustrated. A year or so after the initial drawing, I was looking at a card of a painting of one of Catherine Andrew's paintings and it occurred to me to try painting my earlier drawing. In the process of working on the painting the two people disappeared and the image changed in various ways as you can see. Both the original drawing and final painting are shown here partly as individual images in their own right, and also to indicate how one design can develop from another. Various points can be made about Rainbow Lotus which has always been one of my most popular mandalas. It was the first design I painted which has an horizon and in a sense is viewed from the side in a horizontal manner. It was followed by several related designs which explore this principle which include Flying Lotus and Heart Lotus. 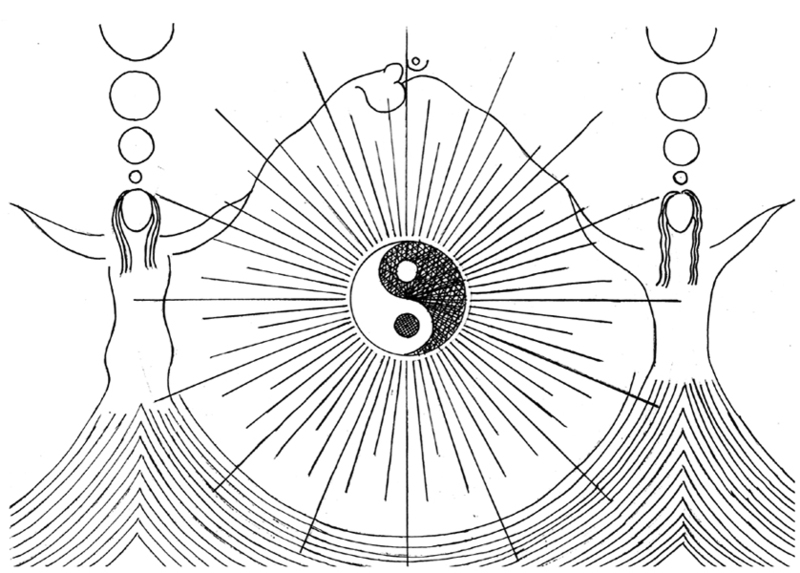 This design was painted in about 1982 and stems from my exploration of yin and yang in general and men and women in particular. It emerged at the time of intense relationship. It represents the striving for, and attainment of balance and unity as a psychological, interpersonal and spiritual process.